Originally I made this page for him, so he'd have a home page! And the love in your heart! Will be in my memory forever! My friend, you will be greatly missed! Lonzo Jarrell Alford, 58, of Quincy died Wednesday. The service will be at 3 p.m. Sunday at Independent Funeral Home in Quincy (875-1529), with burial at a later date. A native of Richmond, Ga., he was a lifelong resident of Gadsden County. He was employed by the Leon County Sheriff's Department and was a member of Jackson Lodge No. 1, F&AM. 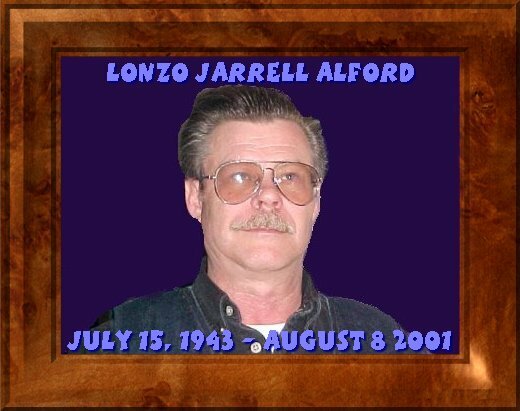 He is survived by his wife, Sandra L. Alford of Quincy; a daughter, Lisa Guancial of Quincy; his parents, Coy T. and Minnie Lee Alford of Quincy; a brother, Tommy Alford of Quincy; three sisters, Loraine Jarrell, Kathy Jarrell and Karen Jarrell of New Jersey; and a grandchild. Right click the note and choose stop, to stop the music at any time.